Anders Albert Andersson-Edenberg, a Swedish journalist who may have played a pivotal role in the development of Dracula adaptations. Picture: GENi. I’m sure guess most of you are aware that Bram Stoker’s famous vampire novel, Dracula (1897), has been modified hundreds of times, sparking countless books, movies and videogames. But who was the first author ever to create such an adaptation? And did Stoker personally approve of it, or even actively contribute to it? For more than a century, the answer has been shrouded in mystery; academic research into adaptations have mainly focused on the stage and screen versions created by Hamilton Deane and John Balderston in the 1920s and 30s, with Stoker’s widow, Florence Balcombe’s permission, and on Wilhelm Murnauʼs unauthorized movie Nosferatu (1922); later, an unauthorized Hungarian film adaptation, Drakula Halála (1921), was unearthed. In 2014, I discovered that the Icelandic version of Dracula, Makt myrkranna, appearing in book form in 1901, contained many new plot elements and characters not included in the 1897 text of Dracula. This triggered the suspicion that Valdimar Ásmundsson, who is mentioned as the “translator” of Makt myrkranna, in fact rewrote Stokerʼs story to adapt it to the taste of his Icelandic readers. But shortly after my English translation of the Icelandic text, Powers of Darkness: The Lost Version of “Dracula”, was released on February 7, 2017, a Swedish version was unearthed: Mörkrets makter. The Swedish version was originally published in two separate variants, in the newspaper Dagen and the magazine Aftonbladets Halfvecko-upplaga. The Dagen serialization started in June 1899, and the (shorter) Aftonbladets Halfvecko-upplaga variant in August 1899, well before the Icelandic version was serialized in Ásmundssonʼs newspaper Fjallkonan. Instead of translating a manuscript provided by Stoker or modifying Dracula on his own, Ásmundsson translated the shorter of the Swedish variants—adding elements from Nordic sagas on his own account. Both Swedish variants were produced by a person using the pseudonym “A-e.” In order to determine how Dracula came to Sweden and whether Bram Stoker was personally involved in the creation and release, I decided to try and find out who was the person hiding behind this acronym. 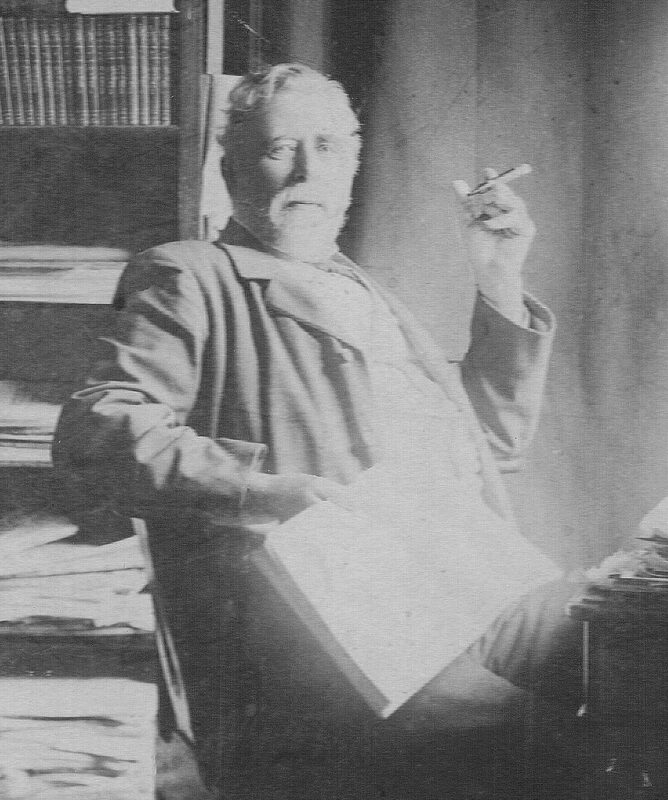 This day, it is exactly one year ago that I came across my first plausible candidate: Anders Albert Andersson-Edenberg (1834–1913), an experienced Stockholm journalist with connections to Harald Sohlman (1858–1927), chief editor of both publications. During the year 2017, I published a series of articles reporting on the progress of my research—some in French, some in Dutch. In a new essay, I have condensed all relevant information from these articles, and added some fresh findings as well; you can download the PDF file by clicking the link below this text. Although a full year has gone by now, no alternative candidates have been proposed. The Swedish scholar Rickard Berghorn, who was the first to inform me about the Swedish version, criticized my findings in December 2017; his criticisms are addressed in the PDF. Except for a single detail, I believe my theory still stands, and Andersson-Edenberg, whose name first caught my attention in the night from March 26–27, 2017, still is my favorite candidate—in fact, the only candidate seriously proposed till now. Of course, my thesis is open to debate, and if you would like to participate in this discussion, or simply be informed on the latest of the many riddles surrounding the Dracula novel, my PDF essay is a must-read for you. It will provide you with essential background information on Andersson-Edenberg and his writings. In my eyes, the articles he wrote for the monthly magazine Svenska Familj-Journalen between 1867 and 1887 are highly significant clues, as many ideas and phrases worded that period show up in the Swedish version of Dracula again. Judge for yourself—and enjoy reading! Hans Corneel de Roos: “Was Anders Albert Andersson-Edenberg the First Author to Modify Dracula?” (4.41 MB PDF). Previous article Can “Vampires” in New York Legally Bite the Heads Off Pigeons and Drink Their Blood?